Over the past 13 years, Thatu has helped change lives in many disadvantaged communities. We have channelled over £210,000 raised through your generosity and fundraising efforts to help communities and schools in many parts of South Africa. We are proud on your behalf for what has been achieved. However, after much thought, Thatu trustees have concluded that like all useful plants, Thatu’s very productive life should come to an end. Times and priorities change and we now believe that it is time to pull up roots and enable others to fill the space we have left in the garden to enable new and perhaps even more productive plants to blossom.We started Thatu because we saw that self-help initiatives in disadvantaged communities in South Africa could be boosted substantially by additional resources. 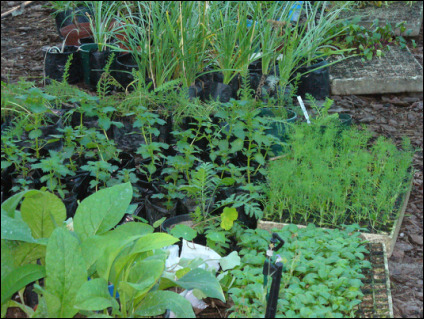 Funding could accelerate the growth of community food gardens, give new educational opportunities and promote self-esteem among those who had few opportunities. The funding we have channelled and the change we have facilitated has been the result of your generosity and fundraising efforts. Thank you to all who have helped Thatu over these 13 years. Thatu, which has always been run by volunteers, has ensured that every penny raised has gone directly to the projects. We have researched to ensure that we always chose reliable, well-managed South African partners, and kept in close touch with them, monitoring their progress. We will continue to raise funds until the end of this year. As before, all funds will go directly to our two reliable not-for-profit partners in South Africa whose needs continue – Midland Meander Educational Project (MMEP) and Soil For Life (SFL). We will consult with them as to the best use of these final payments, aiming to help women and children in particular. SFL has built up and developed an amazing expanding system of helping families in the Cape Flats to grow their own food in their gardens in an extremely harsh environment. MMEP has worked in schools in rural Kwa Zulu Natal to improve their environmental and food-related teaching. With Thatu funding, they have developed a support system for particularly vulnerable children to enable them to build confidence and resilience. We hope you will continue to support them, but from now on please do so directly. We are very confident that they will use any funds wisely. If you would like to make a final donation through Thatu, please do so NOW. If you are eligible for UK Gift Aid, we can increase your donation by 25%. Their need continues, so something extra now will provide a major boost. Please help Thatu bow out with a flourish! If you visit South Africa, do please contact the partners as they will welcome any interest in their work and show you around if they can. Thank you for all your support for these families in South Africa. For further information, please go to our FAQ's page. thatu was created in the UK in 2004 by a handful of people who had been inspired by the initiatives of many communities working against the odds in South Africa to grow a new future for themselves. We support such self-help and home-grown projects in poorly resourced communities in South Africa so that they can flourish and reach their full potential – sustaining the future. • Projects targeting needs identified and articulated by the community. • Long term and sustainable programmes. • Effective communication within communities. • Partnerships with like-minded organisations in South Africa. • Communication between thatu's Friends and supporters, and the projects they support to ensure that we learn from our experiences.